Jonathan Davies expects Ospreys' Dan Biggar to fill Wales' vacant fly-half berth against Ireland. 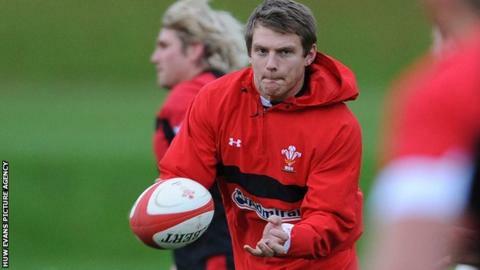 The former Wales captain and fly-half believes Biggar will be selected ahead of James Hook for the Six Nations opener. Wales open their defence of their 2012 Grand Slam against Ireland at the Millennium Stadium on Saturday, 2 February. "They will definitely go with Dan Biggar," said Davies. Wales need a new fly-half for the 2013 Six Nations, with the Scarlets' Rhys Priestland ruled out of the tournament with an injured achilles tendon. Biggar and Hook are the only two genuine fly-halves selected by Wales interim coach Rob Howley in his 35-man squad. Davies, speaking on BBC Wales' Scrum V show, claims Biggar is the form fly-half in Wales so far this season and he deserves his chance against the Irish. Hook scored 18 points in the Catalans' 26-19 victory over Clermont on Friday evening. "They will definitely go with Dan Biggar because he has been the form player, but can he bring that regional form to international level?" said Davies. "That's a big test for Dan but he is a confident player. "With James you don't know what he is going to bring, can he control a game or not? "But sometimes I do think that is a bit unfair because he has been thrown in when he hasn't been playing 10. "You know what Dan does for you and can do for you.... you could start with him, or you could say let's give James Hook a run, see how he goes and if he is not controlling it, then bring Dan on." Davies claimed the fact that Biggar had been in training camp with Wales for the last two weeks would have a bearing on Howley's selection, with Hook a late arrival after playing for Perpignan against Clermont. Biggar, 23, has won 11 Wales caps, but has never played in the Six Nations. Hook, 27, has won 67 Wales caps but has failed to make the Wales fly-half role his own during that time. His move to France to play with Perpignan in the Top 14 has seen Hook emerge as the Catalans' first-choice playmaker. Howley is scheduled to name his Wales side to face Ireland on Thursday. Read more on Six Nations: Late Wales call-up leaves Olly Kohn "chuffed"